Instructions for installing a hotfix. A hotfix is a custom patch for Alpha Anywhere. Hotfixes are issued on a case-by-case basis to address issues found in Alpha Anywhere. If you have been provided a hotfix by Alpha Software, it can be installed using the A5Hotfix.exe executable found in the installation directory for Alpha Anywhere. Do not install a hotfix unless it has been provided to you by Alpha Software. If you are installing a hotfix for the Alpha Anywhere Developer Edition or the Alpha Anywhere Standard Application Server, stop all running instances of Alpha Anywhere. This includes any instance of Alpha5.exe or A5ApplicationServer.exe. You may need to use Windows Task Manager to confirm the process has stopped. If you are installing a hotfix for the Alpha Anywhere Application Server for IIS, stop any application pools that are running. If you did not install Alpha Anywhere in the default installation directory, the [program folder] will be the directory on your system that contains the executable for Alpha Anywhere. For the Alpha Anywhere Developer edition, this is the directory that contains the alpha5.exe executable. For the Alpha Anywhere Standard Application Server, it is the directory containing A5ApplicationServer.exe. For the Alpha Anywhere Application Server for IIS, it is the directory containing A5IISInstallServer.exe. Create a new sub-folder under the [program folder] called hotfix. If the hotfix folder already exists, delete any files in the folder. Unzip or copy the hotfix file into the hotfix folder. Install the hotfix. In Windows Explorer, locate the A5Hotfix.exe executable file in the [program folder]. Right-click A5Hotfix.exe to bring up the context menu and select Run as administrator to install the hotfix. Do not double-click A5Hotfix.exe to install a hotfix. Verify the hotfix has been applied. Open the [program folder] and find the file System.aex. The timestamp on the file should be the current time after the hotfix is installed. If the Application Server is running on Alpha Cloud or a remote ISP, you may not have access to the physical machine. Without access to the machine, you cannot use the steps described above to apply a hotfix to the Application Server. In this situation, the hotfix must added to and published with your web project in order to apply the hotfix to the server. Add the hotfix file to your web project. To do this, click the folder icon on the Web Projects Control Panel to open the project folder in Windows Explorer. Add the hotfix file into the folder. Next, go to Web Project Control Panel > Project Properties. 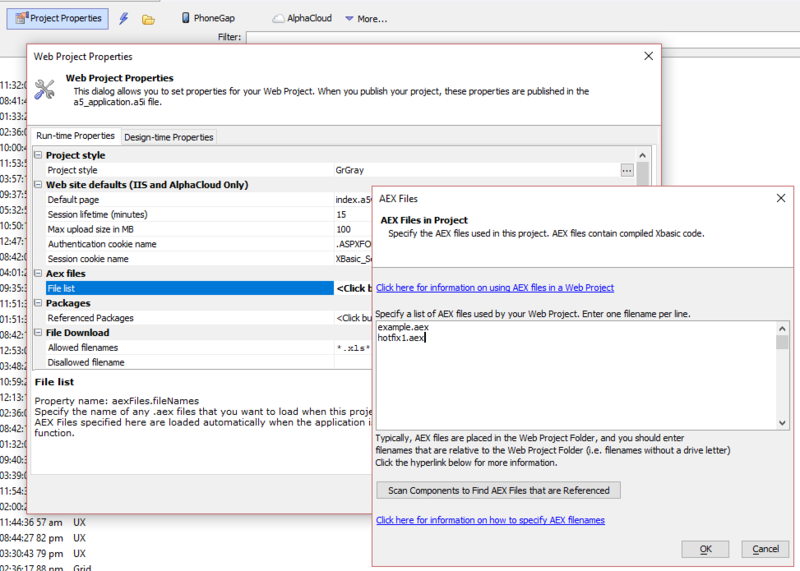 In the Project Properties dialog, add the hotfix file (e.g. hotfix1.aex) to the list of AEX files. Create an .a5w page with the code below. If you have the security framework turned on, be sure to set the permission on this page to "Always allowed".
? "AEX cache has been cleared"
Call the .a5w page you created (open it in a web browser). The hotfix should now be active for this web project. If you have other web projects you will need to apply the hotfix to those projects.